Microsoft on Wednesday launched the general release versions of its Office Mobile Apps for Windows 10, a touch-friendly version of the Office apps meant for Windows 10tablets and small-screen devices. The apps are available to download and install in 190 countries where the OS is currently available, via the Windows Store. As per the firm, the Office Mobile apps for Windows 10 tablets, which include Word, Excel, PowerPoint and OneNote, have been created from ground up for touch. The apps "offer the familiar experience that Office customers expect, and deliver the capabilities people need for on-the-go productivity on Windows 10 tablets and small screen devices," says Kirk Koenigsbauer, Corporate Vice President for the Office Client Applications and Services team, on a company blog post. Notably, Office Mobile apps are meant for devices with screen sizes of 10.1-inches or lower, and can only be used in a limited form (view-only) on devices with larger screens. 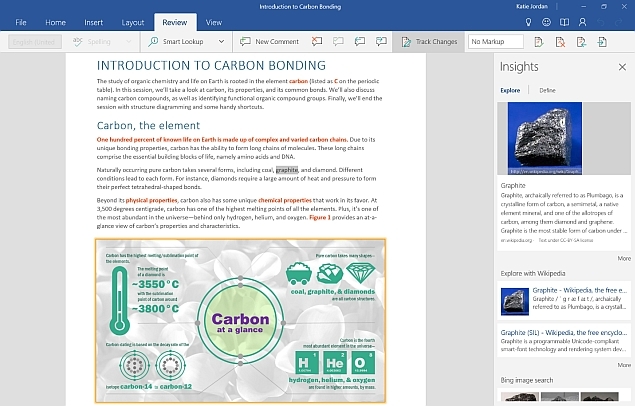 Users will need an Office 365 subscription to make edits on large screen devices using the Office Mobile apps. Microsoft Word comes with the usual formatting commands, styles, fonts and spell check tools, which the users are familiar with. Inserting tables, images, text boxes and more can be done using touch gestures. 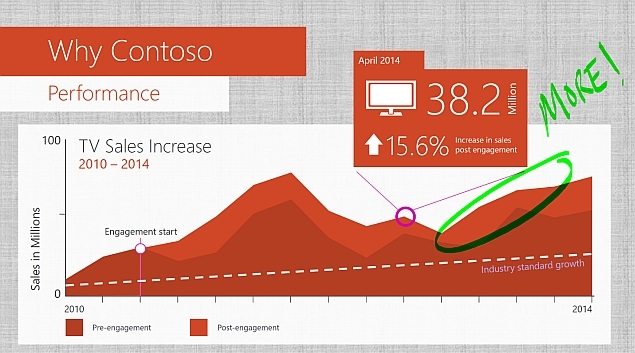 Microsoft has introduced some new features as well, such as Read Mode and Smart Lookup. In Read Mode, the document adapts to the screen size and improves readability by adjusting the font sizes. Users can also zoom in and out in a document with one tap. Smart Lookup brings images and web references from the Internet directly inside the document. The feature is powered byBing search engine. 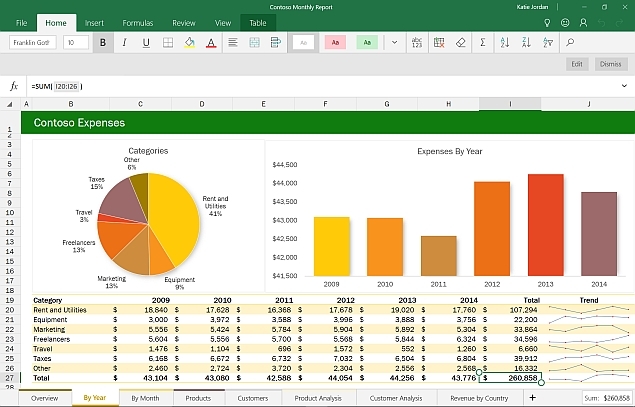 With Excel for Windows 10 tablets, Microsoft has made some tweaks to make it easy for users to perform actions like reordering columns, adding formulas, changing chart types, and filtering data while using touch gestures. The onscreen keyboard has also been optimised for touch. The application has however, got a new feature called Recommended Charts, which gives users the ability to view their data just by tapping few times. The feature is said to be ideal for small screen devices. Microsoft PowerPoint would now let Windows 10 users easily insert images, edit pictures, tables, shapes and more using touch gestures. Rest of the interface stays the same like before . Presenter View can be also used to see content on big screen. New ink, laser pointer and highlighting features are introduced to emphasize on certain content inside a document. OneNote would come pre-installed with the OS and will feature the same set of functions with which regular users are familiar. 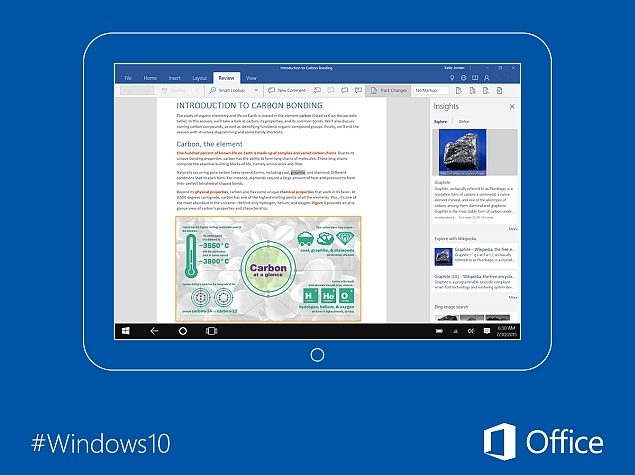 The firm has further explained that Office Mobile apps for Windows 10 is one of the Office deliverables this year. Microsoft plans to launch Office 2016 for Windows desktops in September and Office Mobile for Windows Phones towards the end of this year.